The fourth wave of challenges Epic has cooked up for Fortnite players are now live in-game, bringing with them yet more pirate-themed tomfoolery for Battle Island regulars to revel in at their pleasure. As usual, these latest tasks will be waiting for you upon login and are split straight down the middle. Half are free for everyone while the rest will require that players pick up the paid-for Battle Pass. So without further ado, what dastardly activities are you required to indulge in this time around, to get your hands on those lucrative Battle Stars? First and foremost, you’ll want to ensure your glider piloting skills are up to scratch, as you’ll need to touchdown at five designated locations on the map. Once those are done and dusted, you’ll need to seek out Season 8’s vehicular newcomer that is the Baller and use it in at least five separate matches. Just the simple act of climbing inside its spherical shell will be enough to tick this one off the list, so worry not, about racking up kills while in the driver’s seat. Topping off the free challenges is a simple ask: get one elimination each, with a scoped and suppressed weapon. 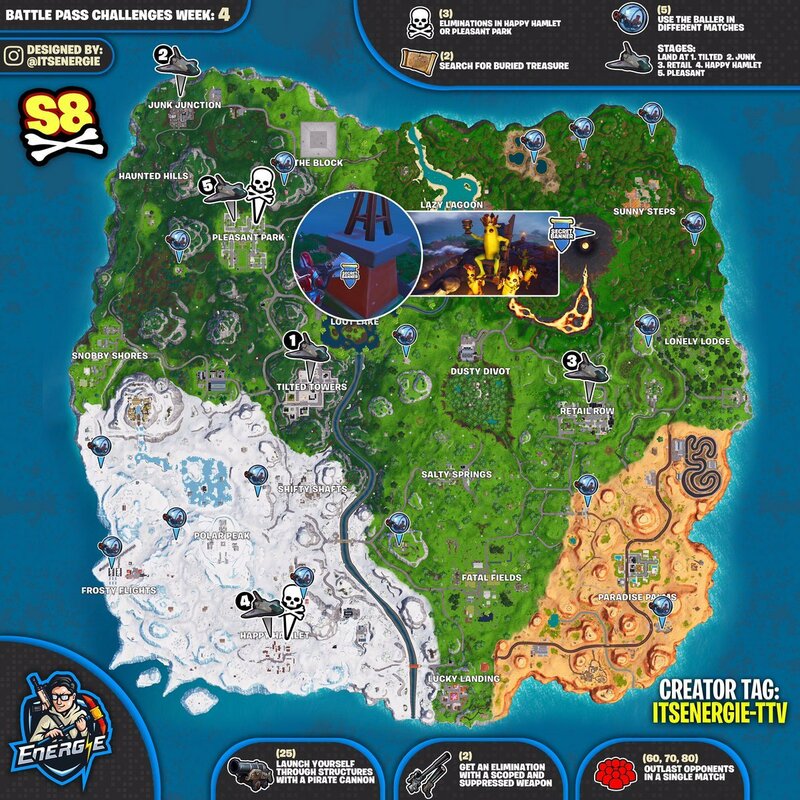 If finding a Baller is proving to be a headache though, see below for Fortnite Insider’s handy cheat sheet revealing every individual spawn point. As for the challenges exclusive to Battle Pass owners, the majority are straightforward, though a couple could prove tricky for those not up to date on Fortnite‘s latest content updates. Simply outlasting 60 other players and getting 10 eliminations either at Happy Hamlet or Pleasant Park will get you halfway towards 100% completion, though you’ll want to use the cheat sheet provided to swiftly find the pirate cannons required for launching yourself through structures. That one will need to be repeated 25 times too, so expect competition for heavy-duty weapons to be fierce. For the final challenge – searching for buried treasure – you’ll need to rely on luck. To even be in with a chance of finding said loot, you’ll need to get hold of randomly-dropped treasure maps. There’s no cheat sheet to help with this one, though we’ve put together a handy walkthrough detailing how best to go about finding a map and what to do with it once it’s in-hand. Good luck!